The Red Kangaroo (Macropus rufus) is Australia’s largest kangaroo. Males are a reddish-brown colour and females more blue-grey. They are rarely found alone, preferring to stay in small groups. Red kangaroos are crepuscular, which means they are active mainly at dawn and dusk. Hopping saves energy. At low speeds hopping on two legs uses the same amount of energy as running on all fours. But, at high speeds, it’s more efficient. The achilles tendon in each hind leg act like a spring, recycling energy with every bound. A kangaroo saves energy every time it breathes. As it hops along, its diaphragm moves up and down. This empties and fills the lungs automatically. A four-legged animal uses more energy the faster it goes. This isn’t the case with a kangaroo. If it wants to go faster, it simply lengthens its stride, without changing its hopping frequency. Desert woodlands and open plains. 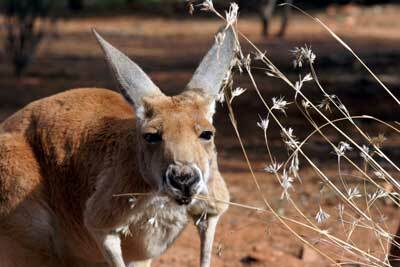 Red kangaroos eat grass, they are herbivores. Dingoes, eagles, desert Aboriginal people prey on red kangaroos. Females average 26kg. Males can grow up to 95kg and 2m tall. Female red kangaroos can have three babies on the go at once: a young joey hopping around at her feet, a small baby in the pouch and a tiny embryo. Within a few days of giving birth, she mates again. As long as there's another infant in her pouch, she'll keep this one in a state of suspended animation. It stops growing when it's about a quarter of a millimetre long and won't start growing again until its sibling leaves the pouch. This is called embryonic diapause. This unique reproductive system helps kangaroos cope with the ups and downs of life in the bush and maintain their numbers through tough times. Female will grow to a certain height and stop growing whereas males continue to grow until they die. Their species name Macropus means big foot.